Awesome Friday! » Blog Archive Rogue One – The New Normal - Awesome Friday! My Dad tells me that he was there at an early screening through pure chance, and how the audience stood and cheered in the explosive finale. I can believe it; it’s a film that defined my childhood and framed my adult life, providing a context for…well, everything. This isn’t hyperbole, though I will certainly accept it’s the definition of fanboyism; Episode IV’s themes of trust, loyalty, risk and reward are hardwired into my moral centre and projected via IMAX screen onto my children. It doesn’t matter that the Force isn’t actually real. The idea of trusting in something higher, bigger – be it God or the Universe or Fate or Yourself – is the key idea that pushes to the front every time I rewatch. It’s a bona fide slice of magic escapism, painted onto the most vibrant of sci-fi canvasses. My love has been tested over the years, though: the games, the prequels, the efforts to recapture that flash of Jedi magic that were squarely aimed at people twenty years younger than me. At some point, older fans like myself just had to let go a little, appreciate that the brand was no longer for us, and stay isolated within the fan films constantly playing in our imagination. But then, with Disney’s acquisition of Lucasfilm, things started becoming exciting again. Gone was Lucas’ stifling, thudding direction – although his art direction remained arguably peerless, even when the awful scripts were doing their best to wreck everything – and in came promises of not just a new chapter, but a new trilogy, filling out the dead space left after Return of the Jedi’s conclusion. The Force Awakens did an extremely efficient job of bringing us all back to the splendor of 1977, for better or worse, and it did so with a trio of new main characters that brought real heart to the uncomfortably familiar story. It wasn’t quite enough, though. I’ve spent most of my life dreaming up Star Wars stories that were not about a youngster on a desert planet being called into a fight against an oppressive right-wing organisation that has a large round weapon with a single weak spot. As I got older, my focus shifted to the Rebel troops fighting on Hoth, with their gritted-teeth approach holding as much drama as the epic magic laser sword battles of the finale. It was these men and women of the air and ground that started to fascinate, with toys in both hands creating endless space battles and land strikes outside of the Jedi Chosen One narrative. It was these stories that I wanted to hear. Hard cut to Rogue One. That first moment of last year’s Star Wars Story™, where everything changes and the rug is firmly pulled out from under your feet. A long time ago, in a galaxy far, far away, then a shrill stab of Michael Giacchino’s score sends us directly in orbit around a new planet. No text crawl, no classic theme; Rogue One immediately lets you know that this is something new. It’s a brave move – one of a few that survived the reported softening via reshoots – and creates a wholly wonderful moment of blissful uncertainly. After being led by the hand through the same old story beats by The Force Awakens, it was finally the moment that made the older fans pay attention. The following two hours were made for me. Specifically for me, and the millions like me that have been pew-pewing their way through motorway tunnels for years. It was clear from the first trailer that Rogue One was going to take a different approach than the franchise entries that preceded it – more grounded, darker, a scrappy antihero heist story about securing the Death Star plans that Vader is chasing in Episode IV. And even though the tone of the film was clearly changed in the late reshoots – forty percent of it, apparently – what is left is a spectacular, morally ambiguous film that forms a perfect jigsaw piece slotted expertly into the side of A New Hope. It’s certainly not without its faults, but it finally gives the non-Jedis a piece of the cinematic action. And the key to its success is how normal everyone is. There’s a lot to be said for straightforward arcs. We get so used to the character journeys in science fiction – and especially in Star Wars – being these huge sweeping curves that begin with ignorance and isolation, but end with being The Chosen One. Anakin, Luke, Rey; each pushed from dust to glory (or destruction), every interaction causing ripples in the world around them. And that’s fine; the Hero’s Journey – the classic story structure that Star Wars honours so closely – needs to have a protagonist that changes everything, both internally and externally. Also, from a marketing point of view, it also helps to have a singular figure of inspiration for the toy packaging. However, the narrative push of Star Wars has always been closely connected with The Force, and each person’s ability to wield it. Hell, Anakin’s entire fall from grace centres around his deep, manipulated desire to be a stronger Force user. This means that every solution is magic; each rousing finale focussed on how The Force comes into play against a stronger enemy. But when the message is this positive, the repetition doesn’t really matter; there’s a great moment in The Force Awakens when Rey, fresh from zipping Anakin’s lightsabre out of Kylo Ren’s ready hand, has a moment of focus and meditation. Even with Ren pushing hard against her, this is her moment of realisation that The Force can make you powerful if you just relax, and breathe. Albeit rather blatant, this is the final opening of the door that teases what Rey might become in this year’s Episode VIII. Her arc is as wide as Luke’s, but here compacted into one film instead of three. Rey is magic, deeply connected with the Force already, as this will be the crux of every future development. In comparison, Rogue One’s Jyn Erso and Cassian Andor’s arcs are so slight that they’re almost flat. There’s been some criticism of this, and I can see how it could be viewed as a negative if a viewer is expecting the standard magic revelations. 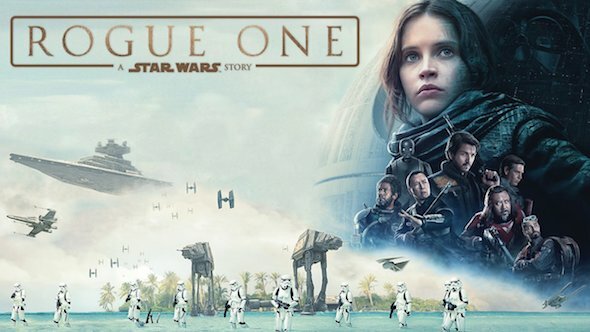 However, their simple intentions imbue Rogue One with a strong sense of purpose; each character changes their outlook and understanding as the film unfolds, but really they want the same thing the whole way through. Jyn, left in the shadow of her father. Cassian, fighting the good fight, in bad ways. They don’t so much as change their arcs, as adapt their existing outlooks to the current situation. Jyn learns, from her father’s deceit, her place in fighting against the Empire with the Rebels. Cassian, faced with the moral reality of his own actions, trusts in the actions of another. And that’s it; they move from fighting for one reason, to fighting for another, but still fighting. It’s the evolution of this fight that has drawn both criticism and praise. Some critics see its uneven structure as disparate elements glued together in the name of pleasing fanboys like me. Others worry that the characters’ motivations never really adapt or evolve, with convenient narrative turns waiting around every plot hole. However, I think this is underplaying Rogue One’s greatest creative decision: its absolute focus on tenacity, stubbornness, and faith. Felicity Jones’s Jyn is not as forward as Leia or Rey, with none of the regal authority of the former or goofy glee of the latter, but she is a constant force of motivation, even if her raw emotions only slip through at the rarest of times. As we learn, she is a trained fighter, dragged out of innocence by antagonist Krennic’s slaughter of her mother, honed into a space marine by Saw Gerrera. That this only emerges through a few throwaway lines is important; Jyn is not a hero, nor has any wish to be revered. She just knows the right thing to do is push ahead, regardless of the certain death that awaits. This quality is infectious, giving Rogue One its wonderfully layered conclusion as more and more rebels rush to join the impromptu attack. It’s this stacking of battle elements that turn the last third into the best Star Wars battle ever filmed. Director Gareth Edwards’ sense of scale, together with the beautiful editing, show these desperate fighters coming together to fight, hope against hope, scrambling for any advantage as the Imperial noose slowly tightens. There has been much publicity about Rogue One’s other possible endings; it’s fair to say that they kept the best one. Job done, faces up into the approaching void is the perfect end for a pair of protagonists that capture the beating heart of regular fighters in the Star Wars universe. Vader’s postscript is just the cherry on that cake, a direct link to the beginning of Episode IV, and a timely reminder that the Sith Lord is there to be feared. By the time the Tantive IV escapes and the credits roll, Star Wars itself has been healed with a much-needed bandage of humanity and bravery. These qualities are what I took from the original Star Wars all those years ago, and this is finally what Rogue One has given back.